Awesome Condition for it's age and weathering! The letters and structured vane are of Cast Aluminum which has a nice worn look and effect. The Bull is 3 Dimensional Hard Plastic with most of it's brown paint weathered away, yet still effective in color presentation. The centerpiece is also of hard plastic. The arrow's base is marked Robbins Maryville, MO. The ½ inch steel rod is threaded at the base. It is constructed so that adjustments may be made with the directional North, South, East, and West sections for accuracy when mounting upon a building or structure. NOTE: The bottom black base is NOT old. This is a desktop Microphone stand that worked well for the threaded steel rod to serve as a nice presentation holder for displaying the Vane. 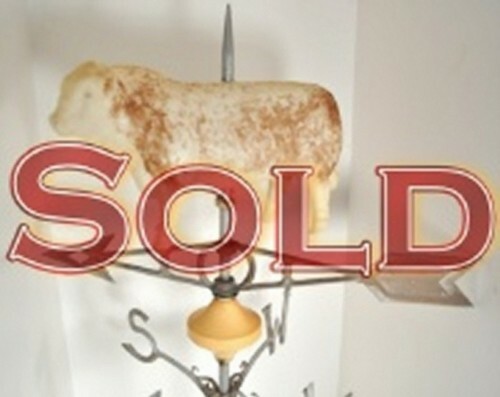 I am including that base with the sale of the Weathervane. It is easily removed for mounting the piece elsewhere. This is a fantastic find that will display very nicely and be one of the showpiece conversation presentations in your home or collection. We never overcharge for shipping and never have. If you have overpaid the actual cost of shipping this item, you will be immediately refunded what you have overpaid! Our shipping cost includes Delivery Confirmation so you may track your purchase.